So the other day I wanted to Monitor some activities in my Azure Notification Hubs, well of course you get the “Monitor” tab in the ANH panel online, but it’s hard to get into details with it as it only shows numerical statistics. 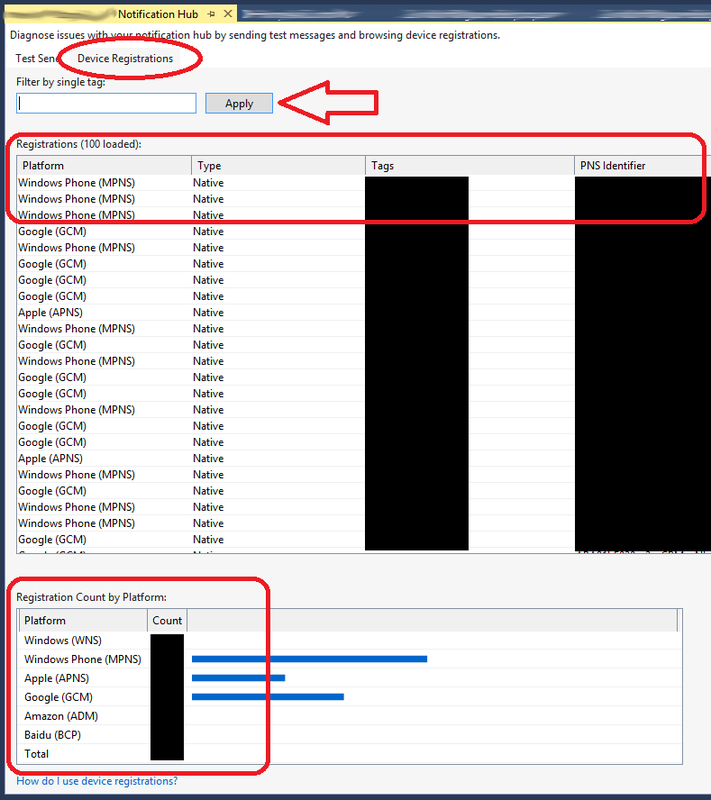 I wanted to be more specifically look into the Device registrations, platform types, available Tags usage, registration expiration and so on. Just as a side-note I actually wish if Microsoft included these features in the online Azure Notification Hub Monitoring panel as well. View all the Device Registrations along with their Platform types, Tags, PNS Identifiers, Registration IDs, and Expiration Days. Simply go to your Sever Explorer Panel -> Sign into your Azure Account (click on Connect to Microsoft Azure Subscription) -> expand Notification Hubs -> choose your desired Notification Hub -> Right Click -> Diagnose ! 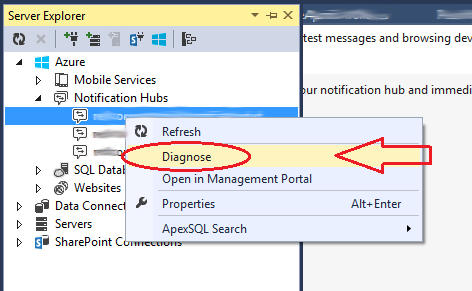 When you open up the Diagnostics, by default it opens up the Test/Debug Push Notification Panel as follows. As I have highlighted above, this option beings some very useful features. 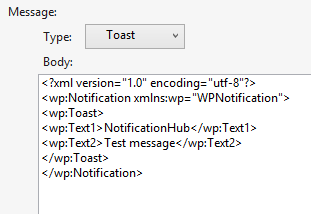 You could include the tags you need to include in your test push notification messages easily or if you want to send without tags, you could keep the Broadcast option. Next you will be surprised that there is a long list of mobile platforms you could choose to send the test notification as shown below. Best yet it also by default generates the sample body, and you just have to insert the required parameters and values, and hit send. Let’s say if you wanted Widows Phone – Toast type notification ? No problem ! Likewise, it is super easy to send test push notifications right from here. This awesome tiny tool also allows you to view all of the Device Registrations along with the following very useful information. Now the above information may seem quite preliminary, but still when it comes for serious monitoring and debugging those are very useful. 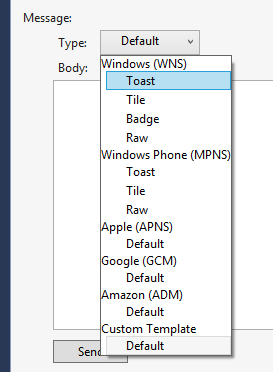 Now we all know how much we use tags along with our Azure Notifications, which is an incredible feature that allows us to send targeted push notifications to groups or individual devices. And guess what ? this tool allows you to easily search and filter through any available tags and view those registration information. Also you can easily sort through the above listed information columns (Platform, Registration Type, Tags, etc) by acceding or descending order as you wish, which makes it really easy to monitor and debug. What if you ever wanted to Edit or Remove some registrations or their data in case of an emergency ? Yep you can easily do that from this tool. Finally another feature this brings is the overall registration statistics of any given platform, which is useful but not very informative though as much as the “Monitor” tab in the online Azure NH Console. I still wish if Microsoft had made all the above features available in the online Azure Hub Monitoring section, which I sincerely hope they would do someday. So about one month back my boss asked me to implement Push Notification support in one of the Xamarin cross platform based enterprise apps we were working on, which is fully implemented with Xamarin.Forms ! We had a Microsoft Azure Account purchased and dedicated for this certain project, which was a lucky point for me having worked with Azure Notification Hub before. Being all enthusiastic, I started by going through the official Microsoft Azure Documentation. It was very well documented, they had articles for Android, iOS, Windows Phone, Xamarin.iOS, Xamarin.Android and even Baidu. But unfortunately not for Xamarin.Forms, the ultimate cross platform awesomeness from Xamarin 😦 ! The requirement of my task was a bit simple, Send a push notification to the client’s mobile phone with some parameters and values in it, and when the user tap on the push notification, the app should open up and display any given information through the push notification. So as the requirement sounded bit simple, I thought of implementing the Azure calls natively in Xamarin (such as Xamarin.Android and Xamarin.iOS project levels), rather than worrying about not being able to implement in PCL project code. Of course I could have also used dependency injection in this case, but I didn’t have to go that far as my requirement was a bit simple. Please keep in mind, if this is the first time you are implementing Azure Push Notifications in your Xamarin project, please refer to the official Microsoft Azure documentation first and then only come back here, otherwise it could be a bit confusing for some of you. Working Azure Account – We are going to use Azure Notification Hub as our Push Notification distribution server. Your GCM and APNs services will be connected to this and Azure will handle all the delivering the notifications through them. Create an Azure Notification Hub service – If you haven’t created a Notification Hub yet please follow the easy steps through the Azure documentation. And also under that, you can check out how to enable the Push Notification in your Windows Phone App. So you wanna open the app and direct your user to a separate page in the app when the User taps on the Notification displayed on the device ? Then you could use the following sample code in your PCL shared project. As you have seen I added a parameter with a default null in the App() constructor, so that when the user taps on the Push notification on the phone, we can call the constructor with any given parameter, so we can determine whether to direct the user to the default home page or the push notification display page. But keep in note this method only works for Android and Windows Phone, as in iOS you can’t catch the Push Notification message tap in the FinishedLaunching() method which is the executing point in Xamarin.iOS ! But not to worry, I have solved that issue as well, which I will show you in the iOS implementation section. Here is the push notification display page. This is where the user will be directed when they click on the Push Notification displayed on the device. Create a new class called ConstantsPushNotif and add the necessary information. Please make sure to insert your Google Cloud Messaging API information and Azure Notification Hub connection information. This class will hold all the necessary constant values for accessing GCM and Azure Notification Hub through our app. Now some of you might get confused about those values above, so here is a small how-to guide. These constant values will be used in all three native platforms projects. Or else for your ease of use, you could define those values in your PCL class as public and refer to them when required from the native project code. Wondering how to get the Google API Project Number ? 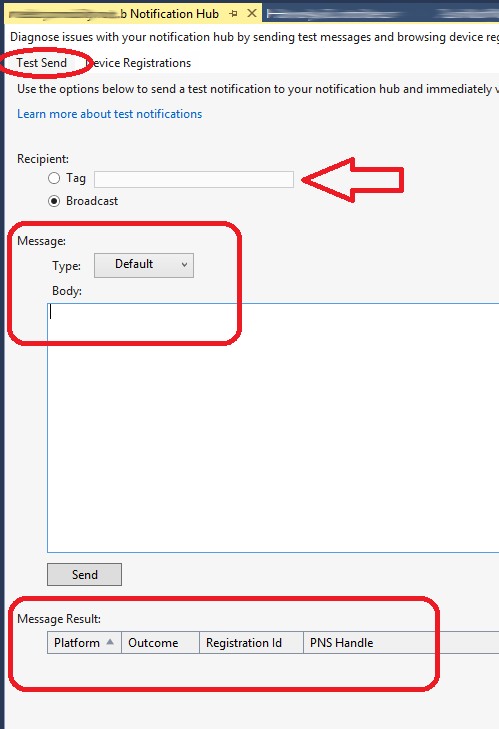 Here it is..
We need to create a broadcast receiver for receiving Push Notifications, and below is the code I have used. Most of the below code was extracted from the Azure documentation, but some I had optimized, such as the Android Notification display section and please note that I have removed all the debug messages. Parameter Passing through Push Notification..
Now lets see the code for the MainActivity class of your Xamarin.Android project. There as you can see, inside the OnCreate() method I’m catching the parameter passed through the Intent, which will be passed in by the Push Notification alert message displayed in the phone. Based on that I’m redirecting the user to the home page or the separate Notification info display page. And also every time the app starts up it will get registered withe GCM service for updating the notification token for the device. Before you begin make sure you have enabled Push Notification Services in your App’s Provisioning Profiles… If you haven’t done it yet, as I mentioned earlier please follow the official Microsoft Azure Documentation for Xamarin.iOS which explains very well step by step.. 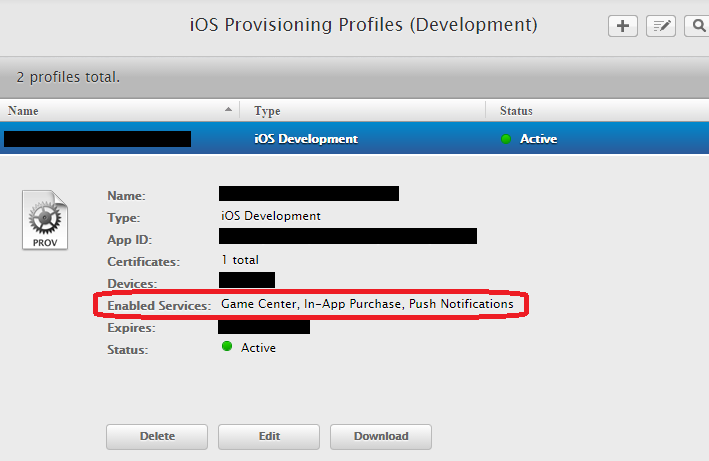 Here is how you could make sure… In the dev center, check the Services section under your app ID..
Don’t forget to re-download all your Provisioning profiles and install them in your iOS buld host through XCode ! So when it comes to the coding, first add the Constants class as we did in Xamarin.Android..
As you can see above I have utilized the code whereas when ReceivedRemoteNotification() gets fired by receiving the push notification from APNs, a message will be displayed, and if the user selects ‘OK’ then the user will be redirected to the notification message display page. Or else if they click ‘Cancel’ the notification will be dismissed. So let’s move on to Windows Phone implementation. I must admit that Windows Phone implementation was the easiest of all, Thanks to Microsoft’s direct support. Before you start make sure that you have enabled Push Notifications permission in your WinPhone Project’s WMAppManifest configuration. One way to send notifications to your Push Notifications enabled apps would be through the Debug feature in Azure Notification Hub, which is a really great feature. For that you need a Azure Hub Full Access connection string, which might cause for some confusion for some of you as we have used the Listening Access string. This connection gives us the permission to send push messages through our Azure Notification Hub. When I followed the Azure documentation, I downloaded the Azure Messaging component for Xamarin (for Xamarin.Android and Xamarin.iOS) as it instructed. After I finished coding, the project compiled without any issue, but then when I deployed it and executed in the device, the app started crashing. Then I tried to debug the app and realized it was giving a runtime exception in both Xamarin.Android and Xamarin.iOS projects, when it initializes the Azure library. Here is another weird situation I noted, after finishing the coding I tried to send my first set of push notifications through the command line client I built. But it wasn’t working, there were no compiling errors or any runtime errors also. But then just out of random I thought of sending a debug push message right from the Azure Hub, and suddenly it all started working fine. If you are following the Azure Documentation code when creating your Push Notification distribution back-end client, make sure to await for the response from the SendNotificaitonAsync() method. So once I was doing some continuous testing Xamarin.Android with Push Notifications using Azure Notification Hub, and suddenly out of nowhere Push Notifications stopped working for Android. I sent several push notifications for Android but none of them got delivered for the test devices. I was wondering whether I was sending too many pushes and the server was rejecting my requests, but it was just about 2 or 3 pushers per hour as displayed in Azure Hub statistics. I tried sending a debug message from the Azure Notification Hub as well, but it didn’t work either. So the other day my boss asked me to implement a few Azure Push Notifications related Web methods in one of our ASP Web API projects I had developed. 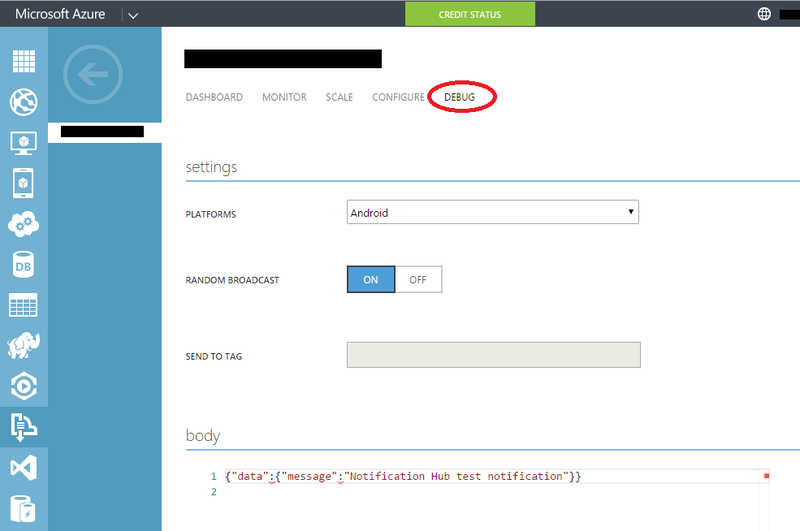 Those Web methods were suppose to send Push Notification messages to the Azure Notification Hub, where as those notifications will be delivered to the User’s mobile devices. When I started implementing I realized when calling the Azure Notification Hub using the Windows Azure Library, I realized there’s only Asynchronous calls available to communicate with the Notification Hub. It got me thinking, How on earth am I gonna call Asynchronous methods inside the ASP Web API (as I haven’t tried that before). Well, after a little bit of playing around I figured it out thanks to some documentations in ASP.NET website. So here I am sharing the code I used for you all, if you ever come across such an implementation, how to call an Asynchronous methods inside the ASP Web API.